The most powerful piece of theatre at last year’s Edinburgh Fringe was Hannah Gadsby’s devastating, deconstructed confessional Nanette. Despite the lavish praise it received from the wider arts press, most theatre folk I know were oblivious to it, because it was concealed behind the cultural iron curtain that is the comedy section of the fringe guide. I was distantly aware the show existed and had been well received, but only really understood what it was when it made the leap to Netflix this summer. This year, I read reviews of Kieran Hodgson’s ‘75 and Natalie Palamides’ Nate that made them both sound considerably better than most of the theatre I’d seen at the festival. I thought ‘screw it’ and booked them both, and am intensely glad that I did. Nate is a brilliant audience interactive show hosted by Palamides’ eponymous douchebag male alter ego. It is excruciatingly funny while stealthily weaving in a number of deeply challenging questions about the nature of consent. Hodgson’s show is a nerdy performance lecture on the history of Britain’s relationship with Europe between 1963 and 1975 that would surely be catnip to anybody who has ever remotely enjoyed a James Graham play. Either could have been classified as theatre; if they were programmed at Summerhall nobody would have batted an eyelid. After all, stand-ups like Mark Thomas and Daniel Kitson get plenty of attention from the theatre press – because they choose to classify their work as theatre. I always grumble at friends who talk about the fringe as if it’s solely a comedy festival, with the theatre merely incidental. But the theatre community can treat it as if it were the opposite. Fringe theatre critics’ avoidance of comedy is not parochialism or snobbery: the problem is that the festival represents a genuinely overwhelming body of work. Limiting yourself to the theatre section at least constitutes parameters. Still, in a year in which the likes of Lyn Gardner and Richard Jordan have mused that there’s not been a standout theatre show, perhaps it’s worth taking a look at the purple section of that mammoth programme for fresh inspiration. That’s what the venerable Total Theatre Awards did this year. 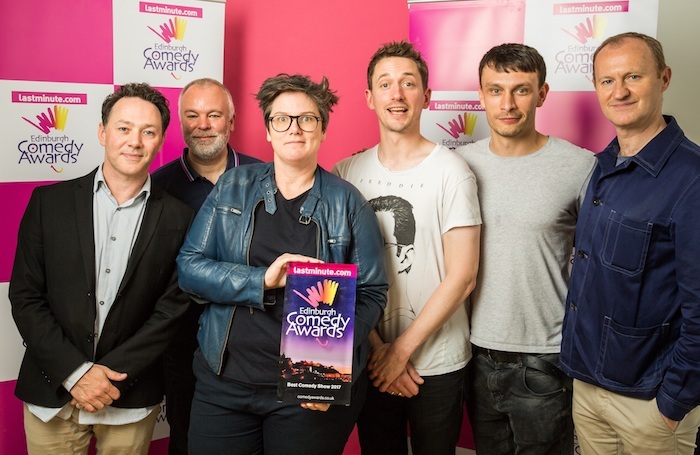 It may have been the only comedy show nominated, but Nate deservedly triumphed in the innovation, experimentation and playing with form category. Randomly picking comedy shows out of a hat is probably not the method to unearth theatrical gold. But I think theatre types at the fringe should consider that it’s worth at least keep an eye on what’s causing a buzz in comedy. There are middling or disappointing plays that might get visited by virtually every theatre hack there, while we’re collectively oblivious to earthshaking work like Nanette that’s happening in the same venues. Theatre, comedy: at the end of the day they’re just labels.